Join the Flora Club and get into a world of privileges! You can get it easy, fast and FREE OF CHARGE through a simple application form at any of our stores! 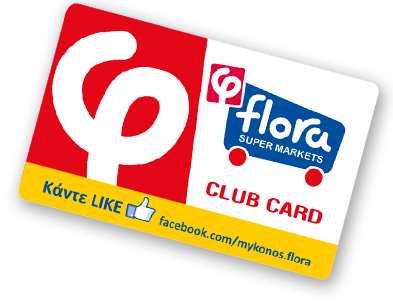 Have Flora Club Card always with you when shopping in our stores! Enjoy its unique benefits and earn points redeemable on any purchase! 1) Fill in the Flora Club Card membership application form and receive immediately from the reception a big card shop and three smaller ones. 2) Insert one small card in your key-ring and the big one in your wallet. 4) Demonstrate your card to the cashier after each purchase. For every 3 euros of purchases, you earn 1 point. 5) When you collect the required number of points, ask for and receive the free gift or gift certificate you wish. For more information please contact your nearest Flora Super Market. At the reception of our stores you can find a list of available gifts and gift certificates you can redeem with your points. The points you earn on every purchase, and your total number of points are shown on the cash receipt.